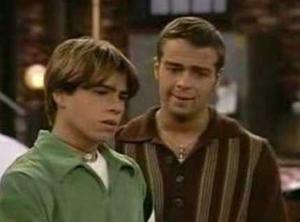 Brotherly Love ran from September 16, 1995 to May 18, 1997 on NBC. It stars the Lawrence Brothers: Joey, Matthew, and Andrew, and Melinda Cullea as their stepmother, Claire. And now, every episode of this classic TV show is available on DVD, exclusively at DVDRare.com! The series is about the life of Joe Roman when he returned to Philadelphia after his father's death in an accident to get his share of his Dad's car customizing business. Joe reunited with his stepmother, Claire, and two half-brothers, Matt and Andy. The Brotherly Love DVD collection is a box set as shown above, all episodes are organize from pilot to finale.